Picking the right trail horse is never a trivial consideration. It is a very important decision and packs plenty of gravity for anyone. A good fit between horse and rider makes all the difference between many enjoyable trail riding experiences, or, well…the opposite. Lacking experience with horses makes the job doubly difficult. 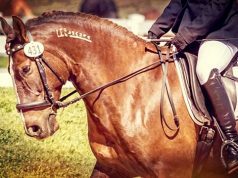 If you aren’t confident in your own equestrian savoir-faire, then finding good advice on how to find the right trail horse for yourself can be just as difficult as finding the right horse in the first place. 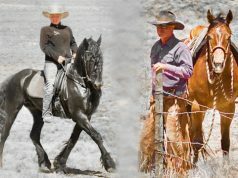 Horsemanship clinicians travel the country and see as many varied horses, riders, problems, and achievements as anyone. Here, we’ve wrangled two celebrated clinicians and put to them the question of what a person might do to find the right trail horse if in the market for one. The candid discussion produced some indispensable insights, and hopefully some of these tips will better your chances of finding that perfect trail horse. Harry Whitney is renowned for “seeing things from the horse’s point of view.” The rodeo circuit was where he honed the horsemanship and animal training talents that later became the basis for the clinic work he’s conducted continually across America each year for more than two decades. Harry also suggests steering clear of horse sales, or at the very least to be dubious of what you are told about horses in them. 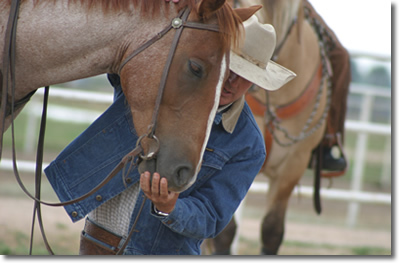 Base your decision on a first hand assessment of a horse if you consider buying at a sale. “I would say feet would be the biggest issue,” Harry explains when asked about what confirmation to look for in a trail horse. “I don’t know how technical you’d want to get on something like that, but you could talk to a good farrier or one of the natural trim people and get some thoughts on how to look for a good foot. But, you know you sure wouldn’t want to have somebody sell you a pretty trail horse that they’ve shown it in a few trail classes at a show, but has got these little tiny feet like a halter horse and it’s never going to hold up out there really riding in rough country. “I hate to tell a story…” Harry continues, “but, somebody was just telling me about trying to sell a horse, and the people came and rode it, and it would just go anywhere, do anything, walk, trot, lope. Just real gentle and quiet. After they’d ridden it and everything, they said, well, they were looking for something with a little more ‘go’ to it. And, they weren’t that experienced riders. They thought that the horse was calmer and quieter than they wanted. 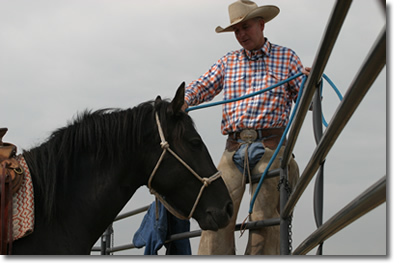 Bryan Neubert travels the country part of each year conducting horsemanship, colt starting, and cow working clinics, and works with problem horses and starts colts when at home from the road. 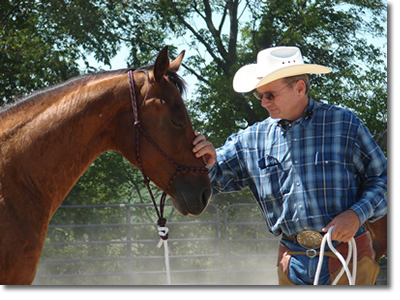 Several videos showcasing his teaching are available including, Wild Horse Handling and The First Week (with clinician Joe Wolter, and his son Jim Neubert). Bryan’s experiences as a cowboy are much like that of a trail rider putting in long days, he figures. Choosing a great many horses for the job over the years provided an intensive opportunity to determine what equine attributes work best in that setting. 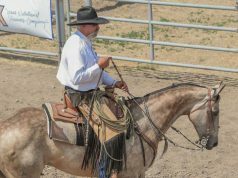 Selecting mounts from a group of ranch horses allowed him the chance to view his prospects in a herd in an open area. Such an opportunity may present itself to you when looking for your trail horse, allowing you to apply his outlook similarly. If not, his advice still addresses what he finds to be the most desirable characteristics in a horse you would want for logging longer days on the trail. 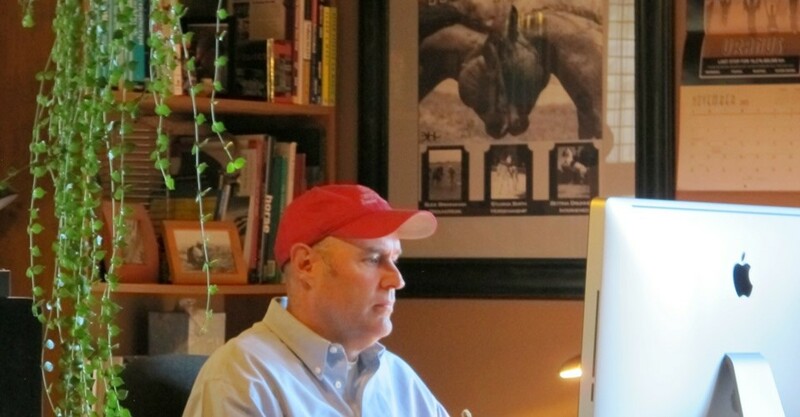 “The second thing that I look for that’s real important is smoothness of gait,” Bryan says. “Which is another thing I don’t know how to affect, they’re either rough or they’re smooth. It’s probably got a lot to do with the shape of their shoulder and pastern and all the joints that make it smoother. When I was younger, I probably would pick endurance over smoothness of gait, and maybe now I’d pick smoothness of gait over endurance. “In watching just a bunch of loose horses traveling,” Bryan explains, “the back is smoother and the horse has got a lot of spring [showing smoothness of gait]. Or if they hit the ground kind of hard–well they’re gonna be kinda hard to ride. You don’t even have to put a halter on them to see that. If I was picking through a bunch of horses, that’s one thing I’m really gonna look for. 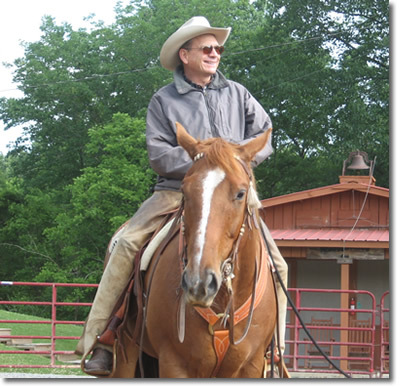 Bryan’s experience as a clinician likewise provides some insight on what to look for in a capable trail horse. When conducting clinics he sometimes asks if anyone’s horse has trouble loading. “And there won’t be anybody say anything,” he explains. “But then I notice they’re having a hard time getting them through a gate, and I’m thinking, ‘And that horse goes into a trailer good?’ They can’t get in the trailer unless the go forward, and they can’t go forward unless they kinda trust your judgment a little bit. Will he come willingly forward when I ask him to? That relates to water and ditches and any kind of thing you might encounter on the trail. You can’t really have a trail horse unless he will load, but you can’t really load him unless you can catch him. The advice works both ways. 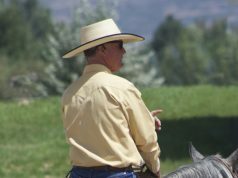 Bryan explains it from the point of view of the trainer/seller, but the buyer likewise can ask the seller go through those motions while observing to better determine how the horse is to catch, saddle, load, or even simply come forward with confidence. Another observation and bit of advice from Bryan comes from a rather funny place. Bryan suggests figuring out a way to check on some of these things when looking at a horse to buy. If you are familiar with using a flag, you might see how the horse reacts to being flagged. If you have your camera handy, you might just approach the horse with it and see how he does. Of course, you don’t want to spook a horse and have him run through a fence, or otherwise cause a wreck, but you ought to be able to assess if the horse is familiar or bothered by some things you will want to use on the trail. A rain slicker is another one he mentions that can be tough for some horses. The example of the video shows also that keeping a close eye on the horse can provide clues to his reactions to things. Keep a lookout for even small things that make the horse nervous or unsettled. Previous articleComparable parts – You are more like your horse than you think!